ps1-1 contains 3 drawing pages as viewed on this web site. There are 2 defined reports within. A stencil containing shapes is included. You will download a .zip file containing ps1-1.vsd and ps1-1.vss. There are no passwords or locks in the file. 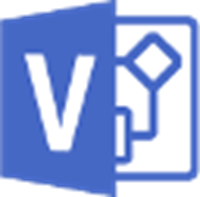 This is a Visio 2003 drawing and you must have Visio 2003 or later to use it. Be sure to see your My account - Downloadable products page. A link to your Download will be there as shown below. The link will also be sent in an email.